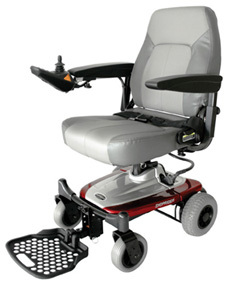 The Smartie light weight Powerchair- The next generation powerchair with environment friendly battery technology. The extended life, high energy Phosphate based Lithium Iron battery will outlast today's bigger, heavier batteries without sacrificing performance. This unit will charge in 85 minuets and provides extended battery life, which gives an incredible advantage over standard gel batteries. The one-touch effortless disassembly makes the Smartie super easy to transport with the heaviest piece only 37 lbs. 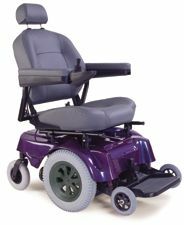 The height adjustable, fully padded seat with seat belt and the fully adjustable footplate makes the Smartie a very versatile electric wheelchair that is easily transportable. Smart design, smart technology, the Smartie will go anywhere you want to go. Light weight and easy to take apart and transport. Heaviest piece only 37 lbs.!!! Environment friendly Phosphate based Lithium Iron battery. 4 ah off-board charger, charges in 85 minuets!!!! Padded, height adjustable seat with seat belt. Fold up removable footrest with full function (height, length angle adjustable). Compact size ( 21.5" wide ) for easy indoor maneuverability. Flip back, height and width adjustable arm rests. Breakdown Seat & controller - 37 lbs. Front Chassis w/batteries - 27 lbs. Rear Chassis w/drive train - 29 lbs. Tires - solid Front. - 6" x 2"
Rear - 8" x 2"
Charger 4 amp, separate unit.